Borneo is very rich with biodiversity, and we can say that this island was one of a few island which we can call it as megabiodiversity island (that's my own opinion). Many kind of animal we can find in Borneo, some of them was easy enough to find, and some other is very shy to meet you, some of them also very exsotic. If you come to Borneo, there is some animal you must see in this island. The orangutans are the two exclusively Asian species of extant great apes. Native to Indonesia and Malaysia, orangutans are currently found only in the rainforests of Borneo and Sumatra. Classified in the genus Pongo, orangutans were considered to be one species. However, since 1996, they have been divided into two species: the Bornean orangutan (P. pygmaeus) and the Sumatran orangutan (P. abelii). 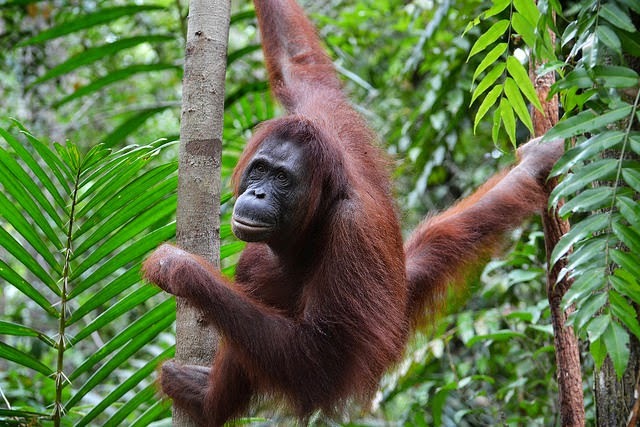 Orangutans are the most arboreal of the great apes and spend most of their time in trees. Their hair is typically reddish-brown, instead of the brown or black hair typical of chimpanzees and gorillas. Males and females differ in size and appearance. Dominant adult males have distinctive cheek pads and produce long calls that attract females and intimidate rivals. Younger males do not have these characteristics and resemble adult females. Orangutans are the most solitary of the great apes, with social bonds occurring primarily between mothers and their dependent cub, who stay together for the first two years. Fruit is the most important component of an orangutan's diet; however, the apes will also eat vegetation, bark, honey, insects and even bird eggs. They can live over 30 years in both the wild and captivity. In Borneo culture, Hornbill was believen as "bird from the up world," in its myth, Hornbill is an incarnation of Dayakness Knight. Hornbill (Allo, Ruai / Arue designation for the Dayak) is a bird species on the island of Borneo. Hornbills have a large enough body size, which is about 100 cm. Hornbill is a kind of bird which has a beak-shaped horns but without a circle. Usually it has light-colored beak. This bird has Scientific name as "Buceros" which refers to the shape of the beak, it has meaning as "cow horn" in Greek. Hornbills Bucerotidae belonging to the group which included 57 species. This bird eat especially fruits, lizards, bats, rats, snakes and various types of insects. 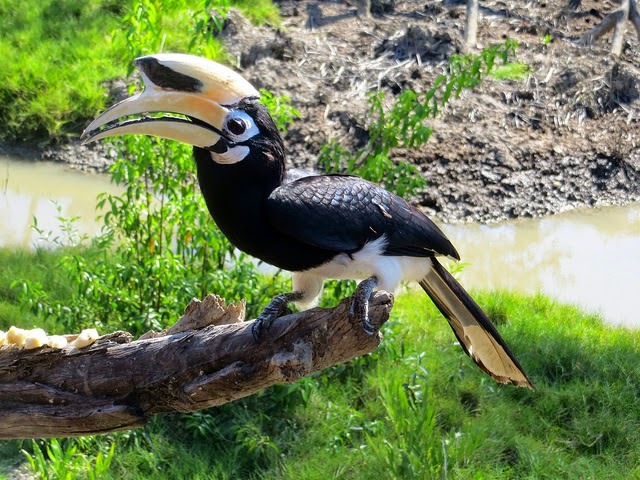 There are about 8 types of hornbills with body color combination of black and white, while the beak color is a mix of yellow, orange and red. The hallmark of this bird is the horn part (casque) growing on its beak. Figs bird food has a special nesting behavior. Hornbills living in pairs and how to lay eggs is an appeal of this species. In nesting period male bird make a hole on a high tree trunk for the nesting of female bird. Then the male birds feeding female the bird through a small hole during the incubation period, and continue until their children grow into young birds. Why hornbill is in use as a symbol by the Dayak? This bird symbolizes the Dayak like birds dove symbolizes purity and immortality in the Christian religion. Hence, the hornbill is used as an example of life for Dayak people in society to always love and loving life partner and caring for their child to be an independent and mature Dayak. But today hornbills has became rare birds that has been very difficult to meet in the forest of Borneo due to the destruction of Borneo Forest which constantly occur, as well as the deforestation and illegal logging to land clearing for palm oil plantations. The fate of hornbills is now as same as the fate of the Dayaks in Borneo are increasingly marginalized in their own land. Now this bird as a symbol only and can only be seen in a recorded image that shows its heyday in the past. This bird can only be seen as a symbol that is depicted in the form of motifs like in this picture. Pity for their fate. The remaining majority of which are only a handful of images and beak and feather parts are still stored neatly by the Dayak community. Proboscis Monkey or so-called Dutch is an endemic species to the island of Borneo (Indonesia, Brunei, and Malaysia). Proboscis is a kind of ape that has a long nose and big with reddish brown hair. In scientific language, Proboscis called Nasalis larvatus. 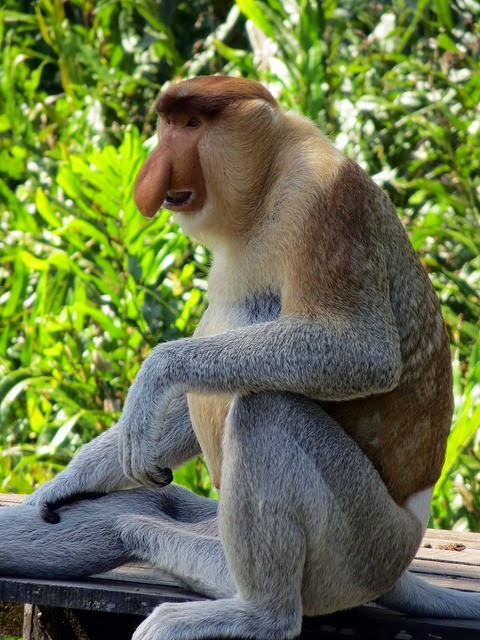 In the other countries this animal referred by several names such as Proboscis Monkey (Malaysia), Bangkatan (Brunei), Bekantan (Indonesia), Neusaap (Netherlands). Borneo Society itself provides some names on this long-nosed monkey species such as apes Netherlands, Pika, Bahara Expanse, Raseng and Kahau. Proboscis which is one of two species members of this genus Nasalis actually consists of two subspecies, namely Nasalis larvatus larvatus and Nasalis larvatus orientalis. Nasalis larvatus larvatus found in almost all parts of the island of Borneo while Nasalis larvatus orientalis found in the northeastern part of the island of Borneo. Porpoises of Mahakam (Orcaella brevirostris) may be the most endangered mammals in the Indonesian fresh water. 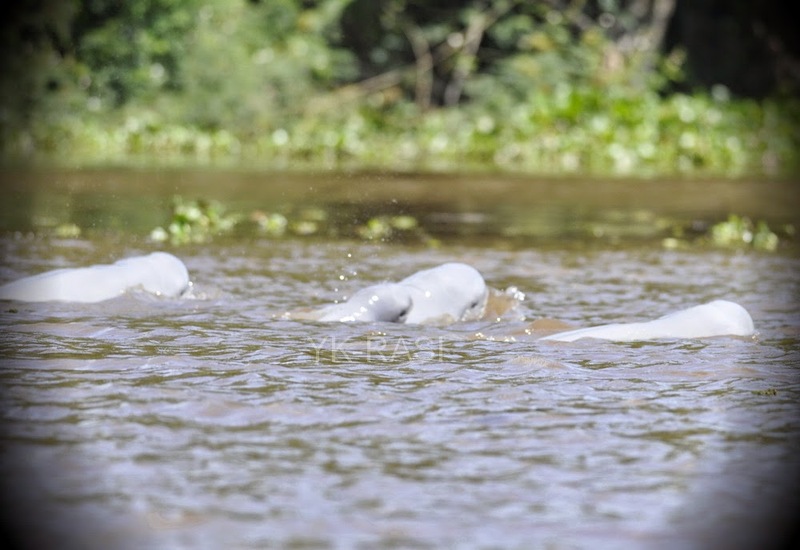 Mahakam Porpoises population estimated at no more than 70 individu. Any of the dolphins which is a sub-population of Orcaella brevirostris could only be found in the Mahakam River in East Kalimantan alone. So it is not surprising then that the Porpoises defined as identity fauna of East Kalimantan province. Porpoises is a unique aquatic mammals. In contrast with the dolphins and whales, Porpoises (Orcaella brevirostris) live in fresh water in rivers and lakes located in the tropics and subtropics. Porpoises is one of the sub-population's (Orcaella brevirostris) in addition to a sub-population of the Irrawaddy River (Myanmar), a sub-population of the Mekong River (Cambodia, Laos, and Vietnam), a sub-population of Lake Songkhla (Thailand), and sub-populations Malampaya (Philippines). Porpoises including one protected species in Indonesia is in English called the Irrawaddy Dolphin or Dolphin Snubfin. Description porpoises. Adult Porpoises has a body length of up to 2.3 meters and weigh up to 130 kg. Porpoises body is gray or gray to dark blue with paler bottom. Body shape nearing the dorsal fin smaller oval and slightly to the rear. The head is round with small-sized eyes. Part of short snout and looks flat with breathing holes. Small dorsal fin is located behind the middle of the back. High and rounded forehead, no beak. Swimming fins are relatively short and wide.